Sports or outdoor activity injuries and many other foot problems can be caused by a misalignment of the feet. This can cause foot, ankle, knee, hip, back, and neck pain. A biomechanical assessment will identify any misalignment. This can then be compensated for by prescription of corrective Orthotics. Orthotics reinstate the timing mechanism of the foot, decrease compensation, prevent further deformity and redirect stress into the joint to set up new joint surfaces and axes of motion. · and if required, a brief observation of walking pattern on the treadmill. To enhance my assessment, I also use the TOG Gaitscan system. 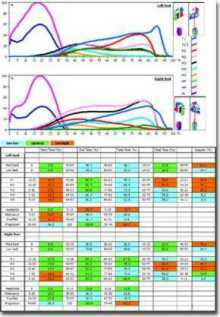 The TOG GaitScan equipment offers state of the art foot assessment technology. It works in 4 simple steps. As you walk across the plate, thousands of tiny sensors capture the distribution of pressure throughout the sole of your foot over time. From your step, the computer then displays on its screen, 2-D and 3-D visual representations of the pressures under your feet. This information is also summarised in an analysis report that can be printed for you to see. The report findings enable me to evaluate your foot function and determine if the symptoms you are experiencing are related to faulty foot mechanics. This information will assist me to determine your need for orthotic therapy and will aid the lab in manufacturing prescrition orthotics to support your feet. There are a wide range of orthotics available to cater for all requirements, whether it be for general use or for specific applications such as running, cycling, golfing, skiing, diabetics, work boots or dress shoes. Some problems may also require the attention of a Physiotherapist in conjunction with or instead of Orthotic therapy.